LinkSprite’s NFC (Near Field Communication) shield is a NFC shield for Arduino built around the popular NXP PN532 integrated circuit. NFC is a short-distance radio technology that enables communication between devices that are held close to each other. NFC traces its roots in RFID technology and is an open platform technology standardized in ECMA-340 and ISO/IEC 18092. NFC is widely used similar to RFID to recognize cards/tags (NXP Mifare cards /tags). NFC can be used as an alternative to Travelcard using the read/write memory provided in cards/tags. Few mobile phones come with built-in NFC – they are used as readers of cards, tags, smart posters with a web URL (like a mobile QR-code reader). This technology is also being applied in smart cashless purchases. Like many other standards, NFC technology is regulated by the NFC which standardizes NFC communication – how the devices pair, share data and allow a secure transaction to happen. The NFC Forum develops and certifies devices compliant with the NFC standards. NFC operates on unlicensed ISM (Industry Scientific Medical) band of 13.56 MHz Frequency. NFC’s communication range is up to 10 cm. But, this is limited by the antenna and power radiation design. Most devices work within a range of 5mm. NFC shield antenna is designed to work within a range of 1cm. The NFC shield provides all necessary circuitry for PN532 like 27.12Mhz crystal and power supply. It also breaks-out the I/O pins of PN532 for easy access. 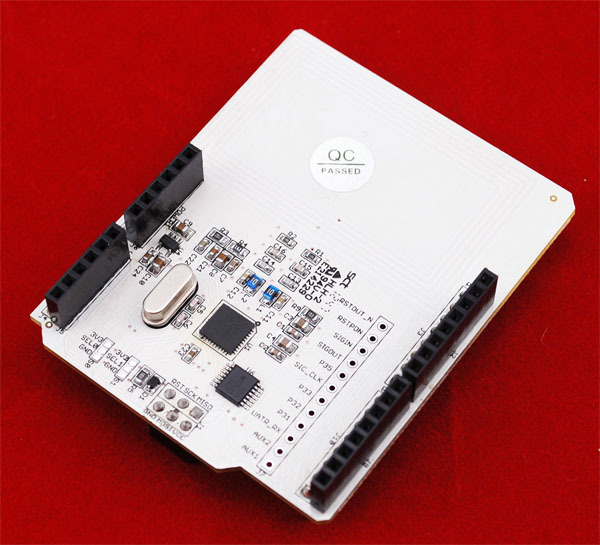 The communication between pcDuino and the NFC shield is via SPI. NFC Shield communicates with the host in three ways: SPI, UART and IIC. SPI communication was used by default. But as you can see from the schematic, IIC has been connected to headers. NFC Shield was designed for Arduino uno, and IIC interface are pins A4 and A5, but these pins are not I2C pins of pcDuino and they are solely ADC interfaces, and it prevents SPI communication. Therefore, in order to use NFC Shield on pcDuino,we need to cut A4 and A5 pins.